Note:- The crucial date for determining the age limit shall be the closing date for booking of Applications i.e. 04.09.2018. 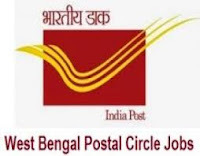 The Applications duly filled in along with original receipt of UCR/MPCM of Rs 100/- (Cost of application form) issued by post office of this circle have to be sent to the (The chief Postmaster General, west Bengal circle, Yogayog Bhawan, Kolkata-700012" through SpEED post of lndia post only . The applications received through Courier or delivered in person will not be accepted.